With my background in computers, I love technology. When technology can be used to enhance what we do, I am one of the first people there to participate. 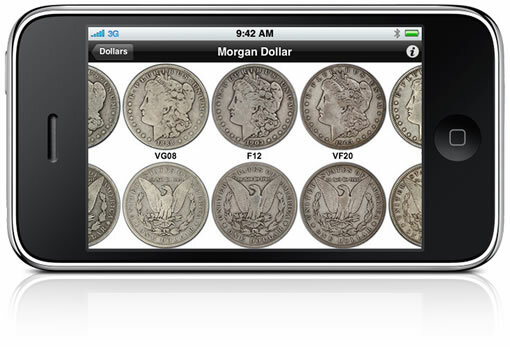 This week, I downloaded my first coin-related iPhone application, PCGS Photograde™ for the iPhone (http://www.pcgs.com/Photograde/). While reading an article reviewing PCGS Photograde website, I noticed they included a banner announcing that the information was available for the iPhone and iPod Touch™ via the iTunes App Store. Excitedly, I clicked the link, read the information, and downloaded the application. After syncing my iPhone with iTunes, the app appeared on my phone. 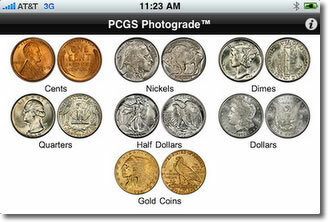 Unlike other iPhone apps, PCGS Photograde starts and stays in landscape mode without an option to change that. Even with that minor nit, the app starts right at the home page no splash screen (a good thing), with an image similar to the one on the website. Although PCGS does not use key date coins for the initial image, the coins used do a very good job in representing their section. 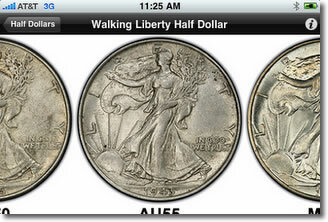 The first limitation I noticed for both the web and iPhone app is that the coins listed were struck in the 20th century. Even if the series started in the 19th century, no series that ended before 1901 was listed. Further, modern coins are not listed unless the series started before the change to clad coinage in 1965. This means that there are no grading images for the Eisenhower, Susan B. Anthony, or Sacagawea dollars. Given that there were some circulation of the Eisenhower and Susie B’s as well as striking issues with the Eisenhower dollar, it would be nice to have an image reference of these coins. As with the website, the user taps either the obverse or reverse image of the coin representing the series to show a page for you to pick the coin type. One more tap displays the coin in various "common" grades, usually from G04 through MS65. The app shows three images at a time and you can scroll left or right by flicking your finger across the screen. To see the details close up, you can double tap the image you want to see and it will expand to show the entire coin on the screen. If you want to see more detail, use the pinch motion to adjust the size. Once you expand the images, you will find that coin images are beautiful. Even when looking at lower grade cents or high grade silver, the images clearly show the criteria for the the grade. The only complaint I have for the images is the use of toned coins. While some people like toned coins, I am not one of them. To me the images with the toning detract from the coins beauty and does tend to obfuscate some of the differences between grades especially Mint State grades which can be difficult without toning. For example, the MS67 and MS68 Kennedy Halves are toned coins which makes it difficult to tell the differences between the two grades. One advantage the iPhone app has over the website is that while viewing coin images there is a button to back up one page. On the website there is a "[home]" link. Although you can go back a page by using your browser’s navigation buttons, having a "go back" link would be helpful. Both the Web site and iPhone app are very useful. But I like the iPhone application for being portable and being able to come with me to shows or coin shops to help me with coin grading. I give both the website and iPhone app a grade of MS64, a common high grade for being very well done but could be better.